My youngest brought me her prized possession yesterday. Its name is Uni. Uni has been a part of our family for seven years now. She goes everywhere with Little Girl. And Uni is well-loved. Held onto with a secure grip, she is now tattered and torn but loved even more than the day she arrived. So Little Girl brought her to me for a much-needed cleaning. It's so hard for her to part with this treasure, but it needed to be done. As she placed Uni in my hands, she asked me to be careful. Quickly followed by needing reassurance for Uni’s safety and a promise they wouldn't be apart for long. Little Girl doesn't trust her unicorn to just anybody. Not everyone recognizes the importance of such a worn out creature, but she knows I do. And yet it was still hard for her to release her grip. It made me think of the things we hold most dear. Not our possessions, but our dreams or our loved ones. Oh, so much of what we hold can be frayed, ragged, and tattered; well-worn by years of relentless love. It's those very things that can be the hardest to release. But God’s hands are the safest place for those things. Just like my daughter had to loosen her grip on what she held most dear, we must do the same. There comes a time where we’ve done all we can, and it’s only in God’s hand where the remaining work can be completed. It’s only there things can truly be cleaned, repaired, shined, or renewed. So are we willing to give him our most treasured items today? 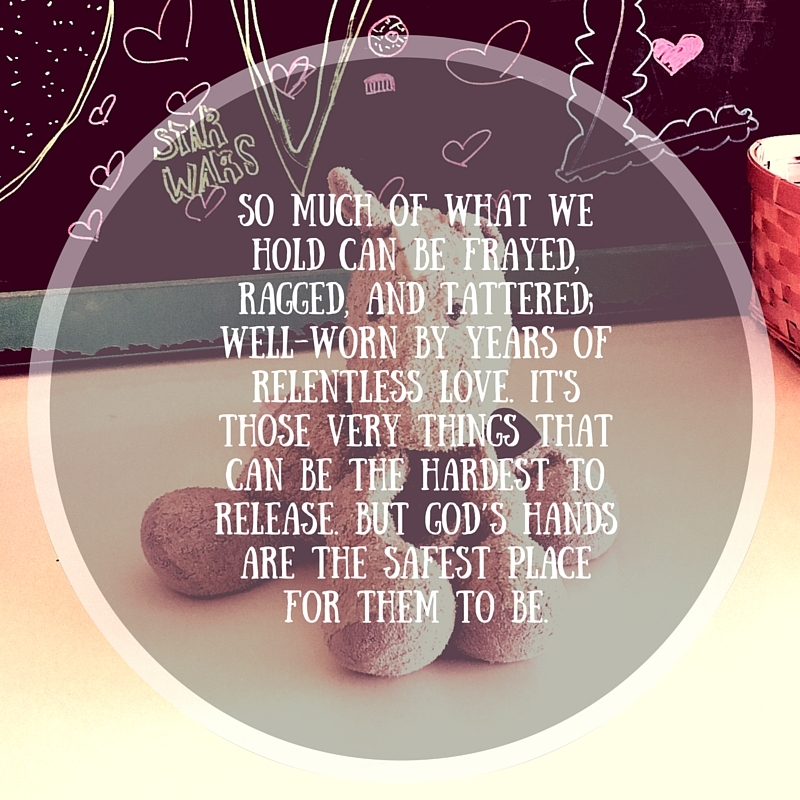 Those things we’ve worn out in prayer because our love for them runs so deeply? He knows how much they mean to you, and he’ll handle them with the most tender care because He deeply loves you. I so recognize the importance of the well-loved Unis in our lives. I still have two from my childhood (a pooh bear and a "ruffy" dog) and my boys have their own (both cows). It was touching to read it put this way. Of course, if we care about the Unis in our lives this much and recognize their importance, how much more does God watch over those dear to us?